Exercise videos, illustrations and science to keep you moving forward. 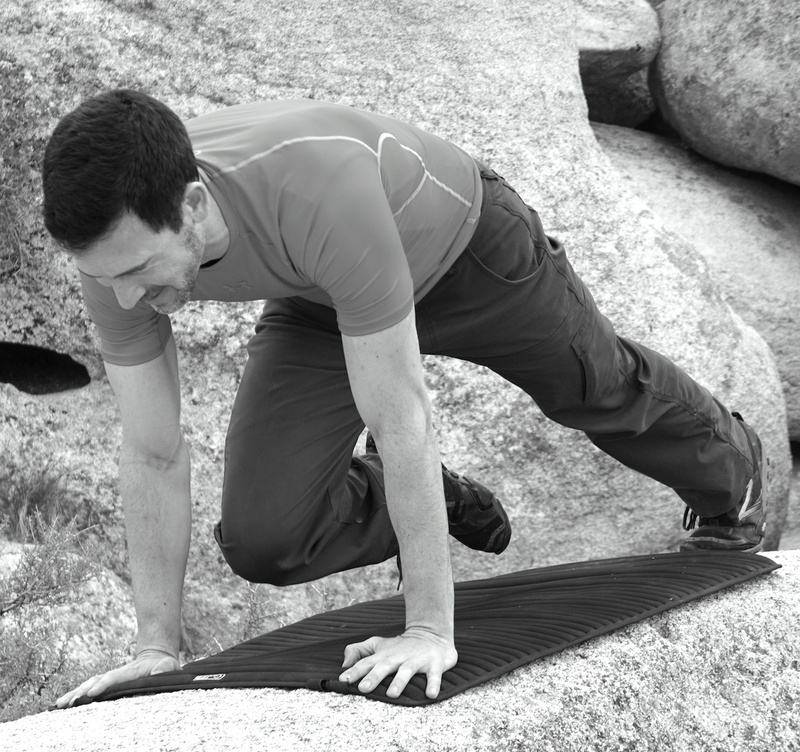 Proper movement patterns are the key to preventing injury and developing your strength and fitness. You can visualize and achieve good form during your workout by matching what you see in my lifelike exercise illustrations. The illustrated routines help you strengthen your lower back, knees and shoulders and improve mobility throughout your body. To speed up your learning process, I included a number of 1 minute exercise videos in the workout articles. Seeing the exercises in motion will help you master the movement patterns more easily. Instructions at key transition points will help you understand the exercise movements. Research has established the level of fitness and the amount of weekly exercise you need for a longer, healthier life. Find out whether you're fit enough to be healthy by taking my recommended physical fitness tests. The articles will show you the proven advantages of improving your strength, endurance and body composition. This entire website is dedicated to showing you what it takes to develop your conditioning, and you’ll have a great starting point when you find out your strengths and weaknesses with these tests. Do you need to ease into your fitness routine because of weak muscles or stiff joints? Physical therapy exercises can help you prevent pain and injury. These routines take the stress off of overworked muscles and joints by strengthening and stretching supporting muscle groups. Exercises like these can make everyday activities such as reaching overhead, working at your desk, squatting, or climbing stairs feel much easier. 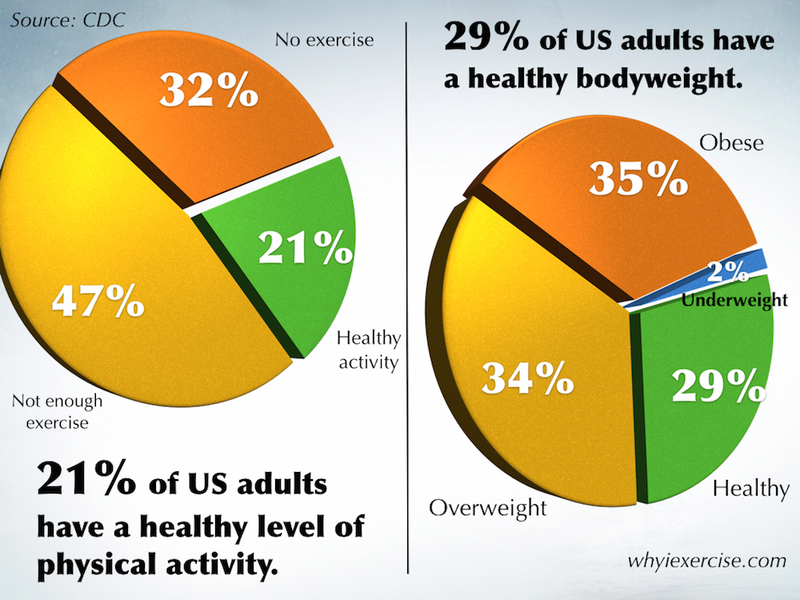 2/3 of US adults are obese or overweight, and 31% are not physically active at all. How is it that we aren't more fit and healthy? We have access to trainers & gyms, technology and more information about exercise than ever before. Why aren’t popular weight loss and fitness tips working as they should? Get some helpful tips and ideas to overcome your busy schedule and put consistent effort toward the great looking, strong, fit body that you want and need. 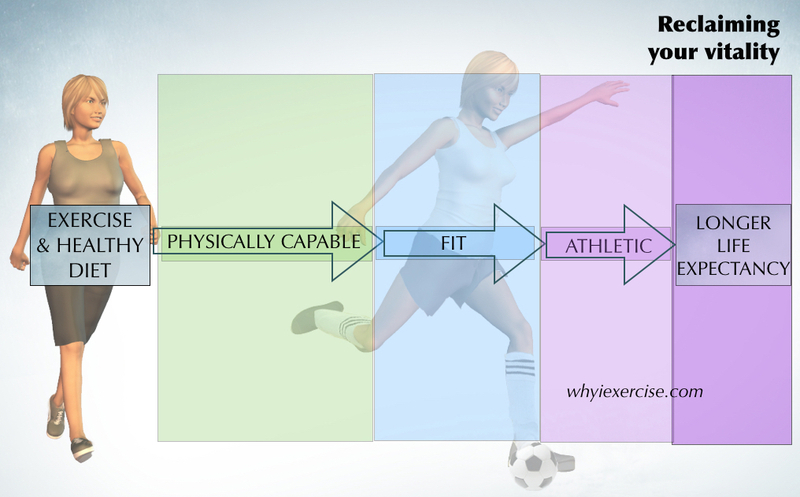 You may find all that you need to develop and maintain a healthy lifestyle through the articles on whyiexercise.com. If so, congratulations and keep up the good work! If you would like more in-depth training, I have created several training programs and reference tools for you. 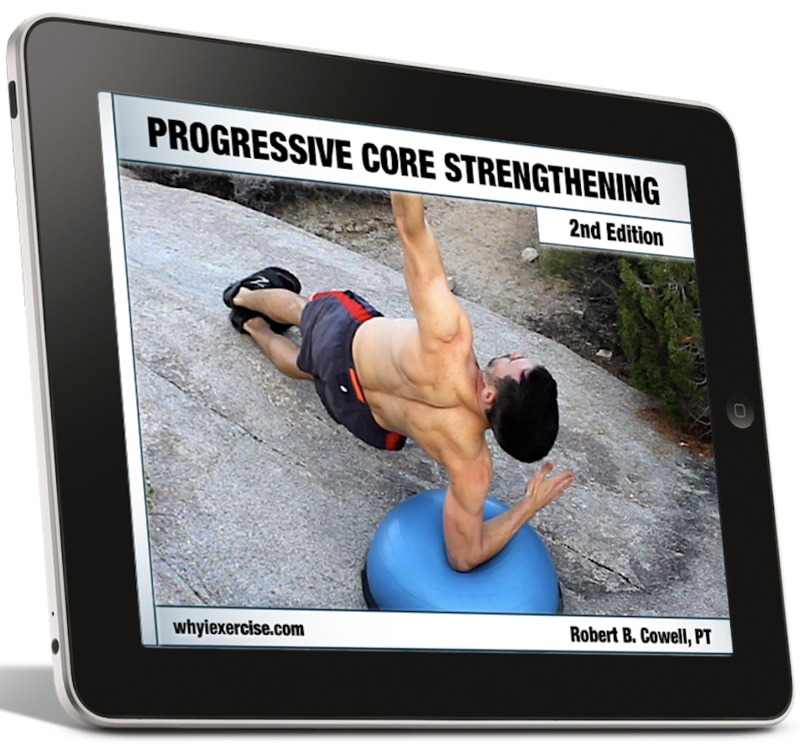 Progressive Core Strengthening teaches you to reprogram your core muscles and guides you through 6 levels of exercise, intro to advanced. The second edition, including new content, is available as an eBook and as a complete online course with workout videos and instructional videos! Depending on your interest and ability level, PCS has also been divided into three parts: The Core Fundamentals, Intro Core Training and Advanced Core Training. Learn more about these eBooks at the eBook store and the online courses at this resources page. Version one of PCS is still available in a bundle with my book, Correct Posture, which shows you dozens of specific exercises that make it much easier to sit, stand and bend with good back alignment. Several of the routines from each book are also available separately. Why exercise? We are out of shape and unhappy with our bodies. The US health and wellness industry is making billions and is growing every year, yet 31% of adults say they do not exercise and only 29% have a healthy body weight. Shouldn’t the financial success of fitness and wellness companies lead to a higher level of health for their users? What’s happening too often in the world of fitness is called ’aspirational buying’. People are busy, and they want a lean, strong body with as little time and effort as possible. Fitness companies respond to this unrealistic demand by offering products with exaggerated claims. Enticed consumers buy the product, and then weeks later they quit exercising. Sadly, it seems that the body they wanted wasn’t worth all the effort after all. A new exercise program, regardless of it’s quality, can only help someone who is willing to change their lifestyle for the long term. Instead of searching for quick fixes, we need to change our daily habits, starting with a new look at our motivation to exercise. If you learn to take good care of your body on a daily basis, your consistent effort will give you the great looking, strong, fit body that you desire (and need). Why exercise? We aren’t healthy and our medical care is too expensive. Globally, the US spends by far the most on health care. Patients are fortunate to have access to the latest technology in medicine and some of the best trained doctors on earth. 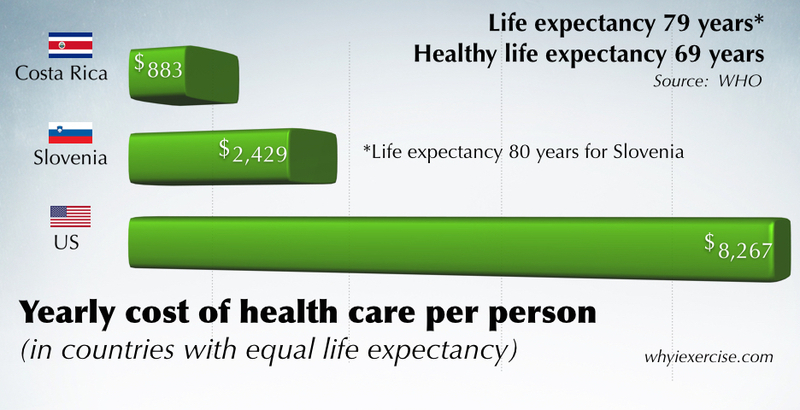 But according to WHO (and the CIA), US life expectancy for 2012 is just 79 years. The US is tied in life expectancy with countries like Costa Rica that spend far less on their health care. With US health care spending at over $3 Trillion per year, the highest in the world by far, shouldn’t people have a longer healthy life expectancy than 69 years? 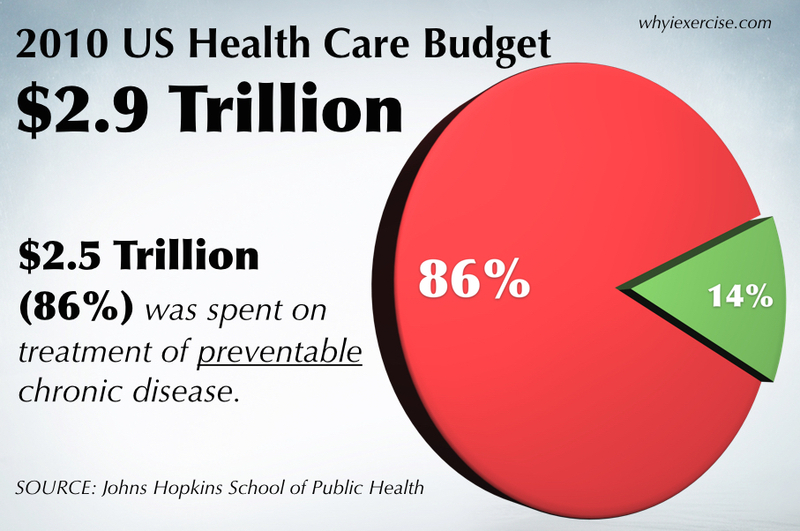 Preventable chronic diseases like heart disease and diabetes are most responsible for the health problem in the US. The vast majority of US health care spending goes toward treatment of conditions which could be prevented with simple measures such as 30 minutes of moderate exercise per day. Supported by extensive research, the Mayo Clinic lists regular exercise as a top prevention tip for heart disease, diabetes and cancer, but yet again, 31% of US adults report no leisure time physical activity whatsoever. Our lifestyles have changed over the past several decades. For many people today, physical activity isn’t necessary, it must be chosen. Most jobs don’t require walking, much less actual physical labor. Food is more plentiful than ever and easily accessed. Many leisure time activities involve sitting and being entertained. Fast food, processed food and sugar laden beverages remain a regular part of our diet. Average TV, phone and computer screen time easily exceeds 40 hours per week. It’s no wonder obesity, diabetes and heart disease have become so common in recent years. The pharmaceutical industry helps us hold off the lethal symptoms of chronic disease, but once a person becomes dependent on drugs to survive, he or she will have seen a significant drop off in their quality of life. Instant access to seemingly unlimited food, entertainment and information has come at the cost of our physical well being. In this modern world, we need reasons to exercise. Choose daily physical activity so you can have better health, a longer life and the chance for more success in your journey. Find out how your health and fitness compares to your peers with several well researched physical fitness tests. Using the tools on this site, you’ll have a complete fitness profile that you can use to track your progress in the weeks ahead. Your results are analyzed to show how much you need to improve to lower your risk of serious health concerns, which is great for setting goals.